I read in the newspaper this morning that Americans' vocabularies are shrinking and it is affecting cookbook writers. Apparently, we are no longer able to discern what it means to dredge, to saute, to fold in, to cream something, etc. Amazing. I read a lot, so that is probably where I attained my vocabulary, AND I love words (hence my daily e-mail from dictionary.com). I am saddened by the thought that people are so badly in need of English lessons AND cooking lessons that they cannot comprehend what is written in a recipe book from the 60's. I'm sure I learned all those things from my mom, who cooked ALOT...a given, since she had 10 kids. And my mother was a very good cook and a very good teacher. I love to cook. My favorite recipe source is The New Best Recipe, by the Editors of Cook's Illustrated (my favorite cooking magazine). I love how they have analyzed every recipe, taking into account the Chemistry of cooking, and find the best way to prepare everything. I have not had one single 'failure' when using these recipes. In fact, they are so good that I am loathe to try anyone else's. The BBC Online has a section called 'The Day in Pictures'. They collect the most interesting images from around the world. This is Thailand, I think. 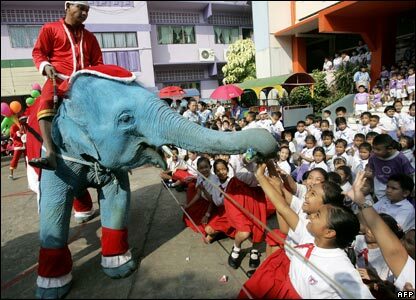 Okay, so who thinks that Santa rides in on a BLUE elephant, dressed in red and white, to deliver presents to the kiddies? But the elephant is darned cute, isn't it? Maybe the elephant could do my 'Santa' duties? Like make the homemade carmelcorn, clean the house before our Christmas Eve Dinner, wrap the last of the presents, and do tonight's cooking? Please? I spent the day feeling so sad. I couldn't believe that we have had another school shooting. But this one's death toll was just so high. And to make matters worse, we know someone who attends school at Virginia Tech. Adam's good friend, Jim T., is a grad student there. Jim spent lots of time at our home in Adam's growing-up years...and they have stayed friends ever since. one of the buildings right next to it. I imagine that Jim's parents were freaking out, as I would have been if this would have happened at St. Andrew's, Colgate, or Oregon State. I feel so very sad for the families of all those who died or were injured today. Nothing exciting in my day but housecleaning...ah, the joy of a clean bathroom. At least I have a bathroom. Watching the horror that is unfolding on the Gulf Coast, I felt so grateful that I have my wonderful home that is safe, warm, and dry...AND that has working bathrooms! I watch the total devastation of a city like New Orleans, and I wonder...how will they get the place back together? How will they get people's jobs back, their houses, their roads, their lives? I look at my beautiful city, and I wonder how I would feel to find it utterly descimated. I cannot imagine!